Please note that your completed form is not a confirmed reservation until an Olde Towne Pet Resort Reservations Representative contacts you. We look forward to meeting you and your pet(s). Please contact us if you have any questions about our services or our online reservation forms below. Please look forward to one of our reservationists contacting you via email or phone regarding your selected service. 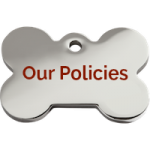 We thank you in advance for choosing Olde Towne Pet Resort and we look forward to taking care of your pet(s) unique needs. We require up-to-date vaccination records, please either bring with you upon check-in or contact your vet to fax to us your pet's vaccination record. Thank You. Effective 12/1/18, holiday reservations over a peak period will require a minimum three night deposit. * I GIVE PERMISSION FOR THE OLDE TOWNE PET RESORT TO USE MY CREDIT CARD ON FILE FOR MY CONFIRMATION DEPOSIT. Yes, you may charge my credit card that you have on file.No, I want to change my credit card on file.